In the 1860s in Japan, a new era is dawning. During this time fraught with violent social upheaval, samurai of all walks of life flock to Kyoto in the hope of joining a band of warriors united around their undying loyalty to the Shogunate system. This group became one of the greatest (and most infamous) movements in Japanese history...the Shinsengumi! Now that Sei has been transferred to the third troop under his command, Saito grows increasingly suspicious of Sei’s true identity. He is visited by dreams of his old friend, Sei’s brother, Yuma. The memories of Yuma’s words gradually grow more vivid, and Saito finally realizes Sei’s secret. Feeling he must protect her, Saito confronts Soji with an ultimatum: expose Sei to Hijitaka and have her dismissed from the troop, or allow Saito to take her as his bride. Taeko Watanabe debuted as a manga artist in 1979 with her story Waka-chan no Netsuai Jidai (Love Struck Days of Waka). Kaze Hikaru is her longest-running series, but she has created a number of other popular series. Watanabe is a two-time winner of the prestigious Shogakukan Manga Award in the girls category--her manga Hajime-chan go Ichiban! (Hajime-chan is Number One!) claimed the award in 1991 and Kaze Hikaru took it in 2003. 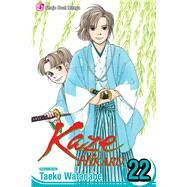 Watanabe read hundreds of historical sources to create Kaze Hikaru. She is from Tokyo.